David Gill Gallery in London presents a new body of work by British artist Barnaby Barford, including new ceramics pieces as well as the first showing of his drawings on paper. 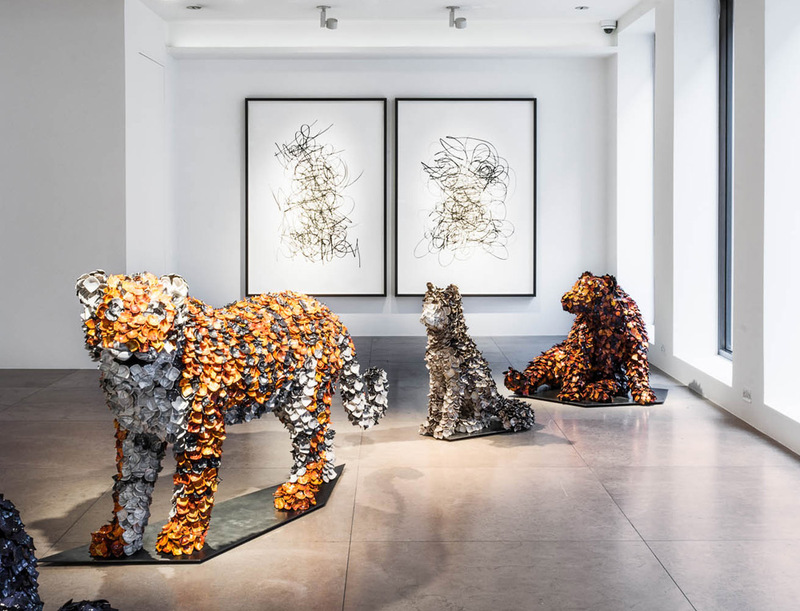 The exhibition includes a series of animal sculptures – marching in single file across the gallery floor – as well as seven large-scale Word Drawings’, while a second room features animal heads mounted like trophies on mirrors, offering an ominous interpretation of the zoomorphic presence in the exhibition. The focal point is no doubt the queue of animals, leading towards a life-sized polar bear. The animals that Barford chose for this (an elephant, deer, a hare, among others) are all hunted and somewhat endangered in their habitat. Here, they behave with almost human-like mannerisms in his sculptures, waiting patiently in a queue. A key to interpret this body of work is offered by the Word Drawings: Barford chose seven words, such as ’change’, ’glory’, and ’power’, which identify ideals to strive for in modern society. ‘They are virtuous words, that have driven humankind to do great things,’ says the artist. But they can easily become warped when repeated incessantly, or exasperated through political propaganda, he explains. ‘It feels that words have never been so important,’ adds Barford, ‘those written in the press, posted across social media and in speeches. In volatile times, words can be dangerous.’ His drawings are a portrait of this exasperation, repeating the words on paper until they overlap to become abstract images. The same patterns from the Word Drawings are reproduced on the ceramic pieces giving shapes to the sculptures.